Sheikh Mohammed's Godolphin operation enjoyed a second winner on day one of Royal Ascot when Barney Roy landed the G1 St James's Palace Stakes. The win followed up success in the G1 Queen Anne Stakes for Godolphin's Ribchester, and in another course-record time - of 1m 37s - the third of the afternoon. James Doyle rode the Richard Hannon-trained Barney Roy, a 5/2 shot, who emphatically turned the tables on Churchill, his conqueror in the 2000 Guineas at Newmarket. Today Churchill (1/2 favourite)could do no better than fourth, as Barney Roy beat Lancaster Bomber and another Godolphin runner, Thunder Snow, by one length and a head. Hannon said: "We felt he was unlucky in the Guineas [when stumbling in the dip], and if he was unlucky he would win today, and so it proved. We have massive respect for Churchill, and I don't think he has run his true race today, but we were there to take advantage. "I was frustrated after the Guineas because he was a little inexperienced - that was what beat him. He nodded going into the dip, lost his stride, and I thought he had broken down. To his credit he quickened up against horses that were already quickening, while Churchill got a lovely run, which was well executed by them. I felt that a flatter track here, without any undulations, would play to his strengths. James came down and rode him around a right-hand bend at Kempton last week, and he worked brilliantly on Sunday, and it's all paid off. "I'm sure our horse will get further - he's in the Eclipse Stakes [10 furlongs] and the Arc [12 furlongs] - he takes time to pick up and he's very relaxed, but a horse having just his fourth race, and to beat a Guineas winner, is very good. "We'll take him home, see how he is, and talk to Sheikh Mohammed. He's done nothing wrong over a mile, so don't get me wrong, but he will get further. "You don't get another crack at the Guineas, but the season rolls on and he'll have a few chances along the way. We brought him here as a fresh horse, so didn't go to the Irish Guineas or anywhere else. That was what Sheikh Mohammed wanted, and he was dead right. "It means everything to win this - we've had a lot of good milers through our hands, horses like Toronado, Olympic Glory and Sky Lantern, and when they leave there is a big hole in the yard, so we are frantically searching for the next one. We thought we had one, and after the Guineas we knew we had one - we just had to get the best out of him." A jubilant James Doyle was delighted to register another Group One victory after he partnered Barney Roy to a game success. Second to Aidan O'Brien's Churchill in the 2000 Guineas at Newmarket last time, the three-year-old son of Excelebration reversed that form in no uncertain terms with a game length-victory in the mile event, with Churchill, the 1/2 favourite, trailing in a disappointing fourth. Always well positioned by Doyle, the Godolphin-owned colt swooped to the lead inside the final furlong as he eventually mastered O'Brien's other runner in the contest, Lancaster Bomber, who finished a creditable length second. Thunder Snow, trained by Saeed Bin Suroor and also owned by Godolphin, was a head further back in third. Doyle was confident coming into the race that Barney Roy would improve for the experience gleaned from his 2000 Guineas run, and he was pleased with the colt's performance, who also broke the track record in a time of 1.37.22s. He said: "That is only the fourth run of his life and he is still learning. In my mind, I just wanted to give him plenty of time to pick up and allow for that inexperience to kick in and he straightened up well and galloped all the way to the line. "He has learnt a lot from the 2000 Guineas. We've done a few bits with him at home. I sat on him a couple of weeks ago at the Hannons' and then we took him to Kempton, more for the experience really. "I knew we could draw a line through the 2000 Guineas as that race was a complete mess. We knew he had an engine and it was just about channelling that in the right direction. "I think he will learn so much that he will sharpen up with racing. He is going to get quicker and I am sure he is going to stay a mile and a quarter no doubt, but he is a pretty good miler at the minute. "It has been an up-and-down season, but when I knew I got the ride on this fella, I was pretty excited. "He felt good at Newbury and then things did not go our way in the Guineas, but he proved there what a tough horse he is. "The tack slipped a bit today which was a bit of a worry. I sat still for a bit and was able to get it back up there. It is bit never-racking because you can never tell how far it has gone back. "I committed him off of the turn and he stuck at it really well. It was great. I can't tell you how much I enjoyed it." Doyle is an integral part of the Godolphin operation which was registering a double on the day following the victory of Richard Fahey's Ribchester in the G1 Queen Anne Stakes, and he was delighted to provide Godolphin founder Sheikh Mohammed with another big-race success. He continued: "Today means everything. This is why I joined the team to ride big winners like this. To get one on a day like today with Sheikh Mohammed here makes me feel very proud. It's very important and there's a great sense of pride to ride him a proper Group One winner at Royal Ascot. "Looking at Churchill's replays again and again, trying to find a chink in his armour, it did not look like there was. I thought he was either an outstanding horse who only does enough or he is just a good horse. Luckily, he is just a good horse and we have got one a bit better." Lancaster Bomber, trained by Aidan O'Brien - also trainer of the beaten odds-on (1/2) favourite, Churchill, who finished fourth - was second, a length behind winner Barney Roy. The son of War Front was sent off at odds of 12/1. His jockey Donnacha O'Brien said: "The lad ran well - he loved the ground." Aidan O'Brien added: "He ran very well - that looked like it was his form. He ran a very solid race. "Churchill [winner of both the QIPCO 2000 Guineas at Newmarket and the Irish 2000 Guineas] ran very well, but there we are. I don't think the ground was an issue. I don't have any plans for him." Churchill was beaten four and a half lengths. Ryan Moore, Churchill's jockey, said: "He was never comfortable. I'm not sure why." Third, a head behind Lancaster Bomber, was Thunder Snow, winner of the UAE 2000 Guineas and Derby, trained by Saeed bin Suroor and ridden by Christophe Soumillon. 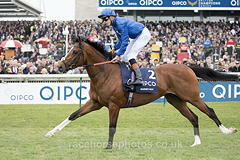 Bin Suroor said: "I'm happy with him - he ran really well. I think he would be better with easy ground, but I'm happy with the way he ran."